Inverter Welders | R.J. Kates Co. 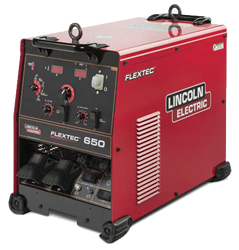 This Lincoln Electric multi-process welder delivers up to 815 amps of welding power for a variety of applications, including construction and fabrication. It features an IP23 rating for outdoor operation and storage, and the latest inverter technology will save you real dollars on the utility costs associated with your welding operations. 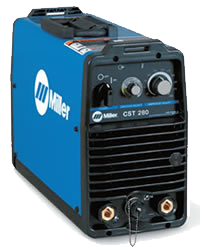 The Miller CST 280 handles Stick (SMAW) and TIG (GTAW) processes. It provides superior Stick arc performance even on the difficult-to-run electrodes like E6010. The Adaptive Hot Start™ for Stick arc starts automatically increasing the output amperage at the start of a weld should the start require it. With a new external switch on the back, the machine can be changed between low and high input voltage ranges and input voltages can be changed without removal from inverter racks. Optional 4- or 8-pack racks are available for multiple operator applications. All CST controls including the power switch are located on front of the machine for easy access. 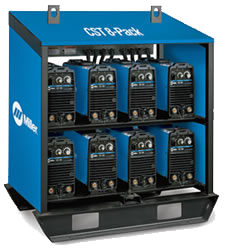 The small size and weight of the 4-pack rack makes it ideal for applications where a high degree of portability is required, such as elevators.The CSTs can also provide for Air Carbon Arc gouging by paralleling two power sources in the rack. 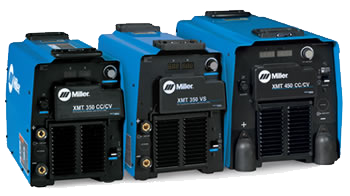 The Miller XMT 350/450 Series Inverter Welders handle MIG (GMAW)/Pulsed MIG (GMAW-P), Stick (SMAW), TIG (GTAW), Flux-Cored (FCAW), Air Carbon Arc Cutting and Gouging (CAC-A) processes. 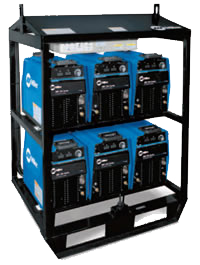 Optional 4-pack or 6-pack multi-paks are factory equipped with power sources, including 20 Amp. fuses to provide primary power line protection for each inverter power supply on 460 VAC. (575 VAC operation, if applicable, also utilizes 20 Amp. fuses). The rack capacity for the 300/350 series inverters is 1 to 6 units. While the rack capacity for the 450 series inverters is 1 to 4 units.